Rough Riders, at his mobile, scrambling best. The career of Julius Caesar Watts took an unexpected turn when he came north to the only league that would let him play quarterback – The Canadian Football League. He would make an immediate mark and almost engineered one of the most shocking upsets in history. When we left you, J.C. Watts had played his last game in college, the thrilling 1981 Orange Bowl. As it turned out, J.C. attracted some interest from NFL teams, but not to play quarterback. I recall in an interview on CFCN Calgary’s “Sports Hotseat” a few years after he came to Canada he said the New York Jets had contacted him, but to play some other position such as receiver or defensive back. He was not interested. Meanwhile, the Ottawa Rough Riders were not doing so well in the CFL’s Eastern Conference. They were having quarterbacking troubles. Head coach George Brancato had become renowned for remaking his team late in the season, taking advantage of NFL cuts to refurbish his team and make a run at the playoffs. The year 1981 would be the best example of that. Throughout my time on the farm I never had access to a lot of sports news beyond the nightly news. We had no newspaper or cable TV. That’s why I was thrilled to read the sports pages of the Lethbridge Herald any time we were visiting relatives in the city. It was on one of those Saturdays I read in the transactions section that Ottawa had signed J.C. Watts. I was so excited. Back then, all the CFL games were still being televised on CTV and CBC. The Ottawa quarterbacking situation had been troubled, with Jordan Case taking a majority of the snaps. I anxiously awaited the next Ottawa game to see J.C. Oh, Ottawa did trot out a new quarterback, but it was Kevin Starkey, not J.C. Watts. It would be a few more games before J.C. made his CFL debut. Eventually he did play, scoring his first CFL touchdown in a 17-7 upset win of the B.C. Lions on Sept. 4, Week 10 of the season. That victory was just Ottawa’s third of the year, as their record improved to 3-6. They would win just two more games in the regular season. One was on Oct. 18 when Watts and Starkey combined to beat Calgary 21-10 in front of the smallest crowd in the history of Landsdowne Park in Ottawa. That raised the Rough Riders’ record to 5-10. They would lose their final regular season game to finish the regular season at 5-11. Watts ended the season completing 77 of 141 passes for 957 yards, with three touchdowns and 11 interceptions. Incredibly, that 5-11 record was good enough for second place in the East. Hamilton finished first with an 11-4-1 record to earn the first-round bye and host the East Final at Ivor Wynne Stadium. Meanwhile, the Montreal Allouettes had new ownership under Nelson Skalbania. He signed a bunch of free agents from the NFL, including quarterback Vince Ferragamo who had taken the L.A. Rams to the Super Bowl. None of that worked, as Montreal finished third in the East with a 3-13 record and would travel to Landsdowne for the East semi-final on Nov. 8. Montreal led 15-10 at halftime and 16-10 after three quarters. However, Ottawa hung around, scoring 10 points to lead 20-16 late in the game. Montreal quarterback Ken Johnson, who had supplanted Ferragamo by this point as the Alouette starter, drove the team deep into Ottawa territory. With 36 seconds left, Montreal had the ball on Ottawa’s nine-yard line but Johnson’s pass in the end zone to Chuck McMann was knocked down by Larry Brune and Rick Sowieta to preserve the Rough Riders’ 20-16 victory. Bring on the Tiger-Cats. The two teams met in the East final on Nov. 15 in Hamilton. It was a low-scoring affair that Hamilton led 13-10 late in the game. Ti-cat quarterback Tom Clements did not have his best game, throwing three interceptions including one in the Ottawa endzone by Glenn Cook with Hamilton up 13-7, but he still had them in position to win. Enter rookie quarterback J.C. Watts. Hamilton backed up Ottawa deep in their own end. Watts dropped back to pass in his own endzone, scrambled away from Ti-cat pressure and threw a bomb to Pat Stoqua. When the dust settled, Stoqua was standing in the Hamilon endzone. They had connected on a 108-yard pass-and-run play, propelling Ottawa to a shocking 17-13 upset, and a date in the Grey Cup in Montreal on Nov. 22. Watts finished the game completing 19 of 39 passes for 311 yards. However, it was his legs that made the difference, as he avoided the tough Ti-cat pas rush and rushed six times for 46 yards. Watts against the Edmonton Eskimos. Awaiting Ottawa in the Grey Cup were the 14-1-1 Edmonton Eskimos, winners of the previous three Grey Cups. On paper, the game seemed to be a monumental mismatch. Edmonton had nine more wins than Ottawa, and had lost just one game all season. The Eskimos entered the game 22.5-point favourites, while many considered Ottawa the worst team to ever qualify for the Grey Cup. Someone forgot to tell Ottawa they weren’t supposed to get blown out. Watts moved Ottawa crisply, taking them into field-goal range twice. Kicker Gerry Organ made no mistake, connecting on field goals of 34 and 37 yards in the first 10 minutes to give the Rough Riders an early 6-0 lead. 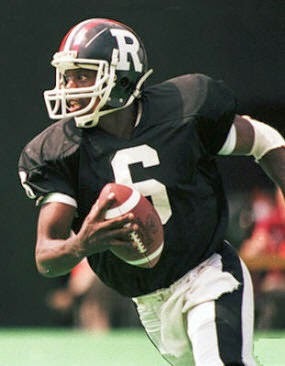 What became apparent early was Ottawa’s defence was ready for Edmonton and their star quarterback Warren Moon. Late in the first quarter Sowieta intercepted a badly-thrown Moon pass, helping set up a one-yard touchdown run by Jim Reid. The Organ convert made the score 13-0. The defence continued to dog the Eskimos in the second quarter. John Glassford intercepted another Moon passing, setting up a 14-yard touchdown run by Sam Platt. I remember that run well, because he dragged Edmonton defenders with him into the endzone. (Coincidentally, on New Year’s Day Platt had lined up opposite Watts in the Orange Bowl when his Florida State Seminoles played Watts’ Oklahoma Sooners). Organ added another convert to make the score 20-0. The Eskimos’ lone point in the first half came off the toe of Edmonton kicker Dave Cutler when he missed a 24-yard field goal. Watts and the Rough Riders went into the dressing room poised to engineer one of the greatest upsets in CFL history. The Eskimos had other ideas. After all they were the three-time defending Grey Cup champions. Coach Hugh Campbell had pulled Moon in favour of wily veteran Tom Wilkinson, who settled the offence down and moved the ball, allowing Moon to re-gain his composure before going back in. The third quarter was a mirror image of the first. Jim Germany scored on a two-yard run to close the gap to 20-7, before Cutler’s convert made it 20-8. Ottawa showed signs of fatigue and nerves. Watts fumbled deep in his own end, and Edmonton’s Dale Potter recovered. That turnover set up a one-yard Moon quarterback sneak, closing the gap to 20-14, and even further with Cutler’s convert. Ottawa 20-Edmonton 15 after three quarters complete. The fourth quarter would be one for the books. Ottawa’s defence rose up again, recovering a Moon fumble, setting up a 28-yard field goal by Organ to extend the Rough Riders’ lead to 23-15. Moon rebounded, taking his team down the field, capping the drive off with another one-yard touchdown plunge, cutting the deficit to 23-21. On the ensuing convert attempt, Coach Campbell decided to go for two. Moon proceeded to find Marco Cyncar in the endzone for the two-point convert, tying the game at 23-23. Then controversy struck. With about four minutes remaining, Watts completed a 20-yard pass to Tony Gabriel for a crucial first down. Eskimo defender Gary Hayes was hanging all over Gabriel, and there was a flag down. Inexplicably, the official called pass interference on Hayes and Gabriel. Ottawa ultimately had to give up the ball. It was the opening Moon needed, taking the ball into field-goal range where Cutler made no mistake on a 27-yarder with three seconds left. Edmonton had their first lead of the game, 26-23. However, Watts was not done yet. Instead of taking a kick off, Ottawa took the ball on their own 35-yard line, giving J.C. one last chance with the ball. He danced all over the pocket, and took off. It looked like he might break free, but he just had too far to go. He was tackled and the final whistle blew. Edmonton had come all the way back for their fourth consecutive Grey Cup – barely. Watts was named offensive most valuable player for the game, while John Glassford was named defensive most valuable player. It was also the last game for Gabriel and Wilkinson, who both closed out hall-of-fame careers. The future looked so bright for J.C. and the eastern Riders. Just a couple plays away from winning the Grey Cup, they had a good defence, some young talent – and the reigning Grey Cup most valuable player. Yet the future would not unfold as anyone expected.